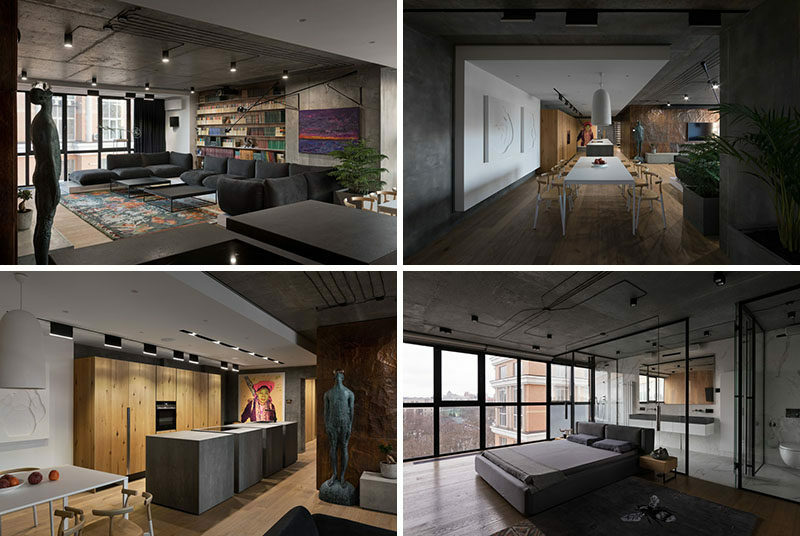 Sergey Makhno and his team have designed this modern apartment in Kyiv, Ukraine, for a couple who likes reading and contemporary arts. Entering into the living room, there’s a decorative copper wall, giant bookshelf, and statement art pieces that add texture, color, and sophistication to the living room. 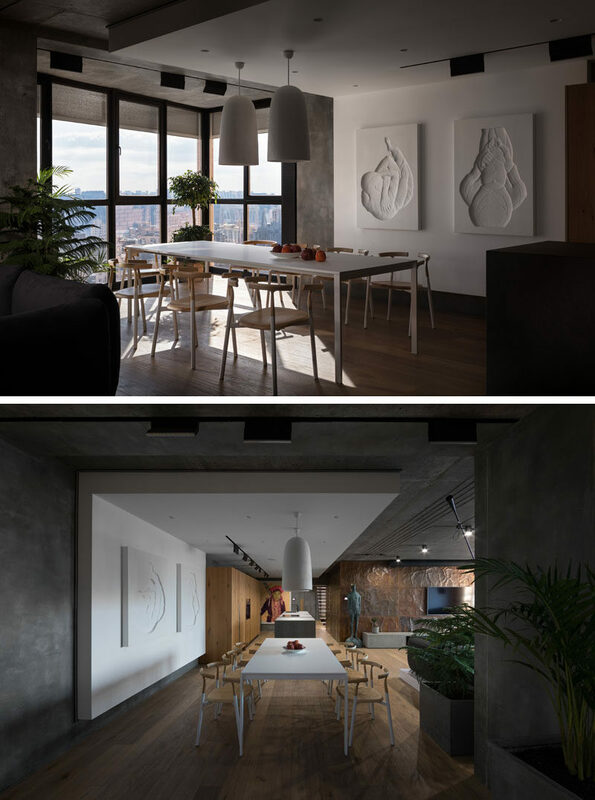 The dining area in contrast to the living room, is adorned with pure white walls, white pendant lights, and two white hanging art pieces. The simplistic dining set compliments the wood flooring and accents found throughout the rest of the home. By locating the dining room beside the windows, natural light fills the room and provides a view of the city while enjoying a meal. Next to the dining room is the kitchen, where the focal point is the island with separated sections. Behind the island is a wall of wood cabinetry, and on the opposite wall is the continuation of the copper wall from living room. Minimalist track lighting allows for the island and another statement art piece to stand out in the kitchen. The front hallway is a mix of concrete and wood which ties into the rest of the home. The hallway is simplistically lit, and each wooden step of the wood and steel staircase leading upstairs is individually lit. In the master bedroom, one wall is made entirely from floor to ceiling windows, once again allowing the view to be the focus in the room. A wood accent wall in front of the bed provides a place to hang a tv, while a glass wall behind the bed gives views of the master bathroom. The master bathroom is kept bright with the use of marble for the floor and wall. The concrete and white cabinet vanity with a double sink, maintains the theme of concrete used throughout the house, and gives it a sleek industrial finish. The frosted glass panels beside the spacious glass enclosed shower allow for privacy when needed. The guest bedroom with wood walls and floors, adds a punch of color with use of teal bedding and colorful pendant lights. A simple art piece hangs above the bed to break up the wood wall. 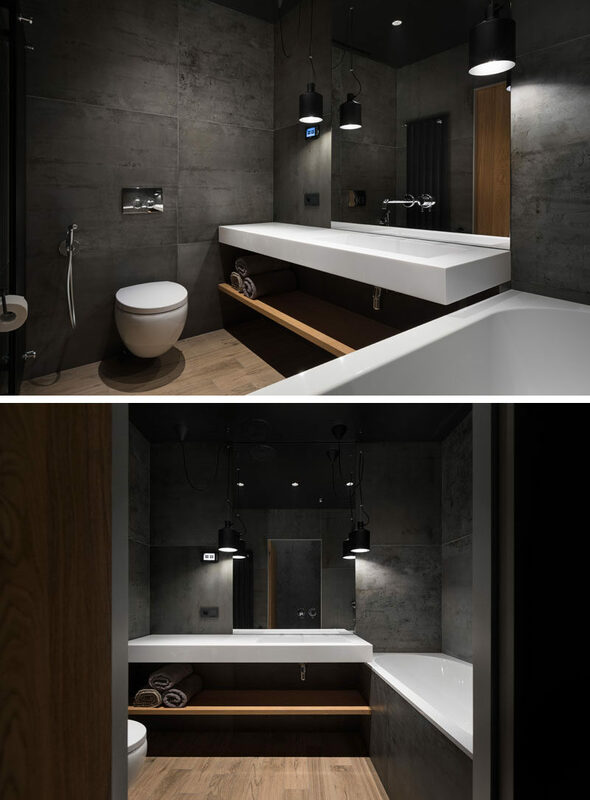 This bathroom is made up of concrete with wooden accents and flooring, and hanging light fixtures. The pure white floating countertop below the mirror has a seamless sink, while the matching bathtub has a surround that matches the walls. In another bathroom, there’s another white floating countertop and wooden shelves with hidden lighting serve as a storage place for both small ornaments and toiletries.